A friend of my daughter, subscribes to the Hello Fresh service and sometimes when my daughter doggy sits for her, she has tried a few of thier meals. I liked this one for a couple of reasons – first, it doesn’t include the breading; nor do you have to really roast the Pabalanos before you cook the dinner and lastly I really am a huge fan of Pablano peppers. I tweaked it a bit to make it work for 4-6 people and made my own (Emeril’s recipe) Southwestern Spices. It turned out great! Preheat oven to 400 degrees. Place rice in rice cooker. Layout peppers on a rimmed cookie sheet, drizzle olive oil over peppers and salt and pepper. Place on middle shelf, and bake until softened. ~15 minutes. Turn the Oven to Broil. Heat remaining oil, in a large skillet in medium heat until simmers, add tomatoes, onions, garlic, and Serrano. Stir until onions are softened and starting to brown. Add broth and stir. If rice is done, proceed to step 5, if it is not done yet, turn off heat until rice finishes, then return heat to medium. Incorporate rice into tomato, onion mix in skillet add butter, Southwestern spice and salt and pepper to taste. Throughly mix the rice in. Spoon rice mixture into each half pepper until all are filled. Place any remaining in a oven proof bowl. Prepare crema. Mix sour cream, lime zest and 2 Tbs of water in a small bowl and set aside,. 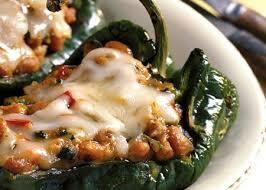 Cover each stuffed Pablano half with Monterey Jack cheese. Place under broiler until cheese melts and browns at he edges (~2 or 3 minutes). Garnish each pepper with, crema, diced avocado, your favorite salsa, chopped cilantro and a drizzle of Key Lime Juice.